After a sharp rise in consumer complaints against license qualifiers who have been granted a test waiver, the Enforcement division has established a task force to investigate cases where Responsible Managing Officers (RMOs) are suspected of acting as paid figureheads for a company, but exercise little to no control over its operations. Contractors who serve as qualifiers for a company's construction operations must exercise direct control and supervision. If you are an RMO and do not have active involvement in the construction and business operations, you risk CSLB administrative penalties against your license(s) as well as criminal prosecution, regardless of whether you're aware of substandard work being performed by unqualified individuals. In a sample group investigated earlier this year, consumer complaints were filed against 40 percent of the RMOs who qualify licenses. A similar review in October 2012 identified complaints against 23 percent of the sample RMO group. By comparison, only about 3 percent of CSLB's almost 300,000 licensed contractors are the subject of a consumer complaint each year. The task force will be watching for exam waiver requests from applicants suspected of only seeking to rent their name for a fee. 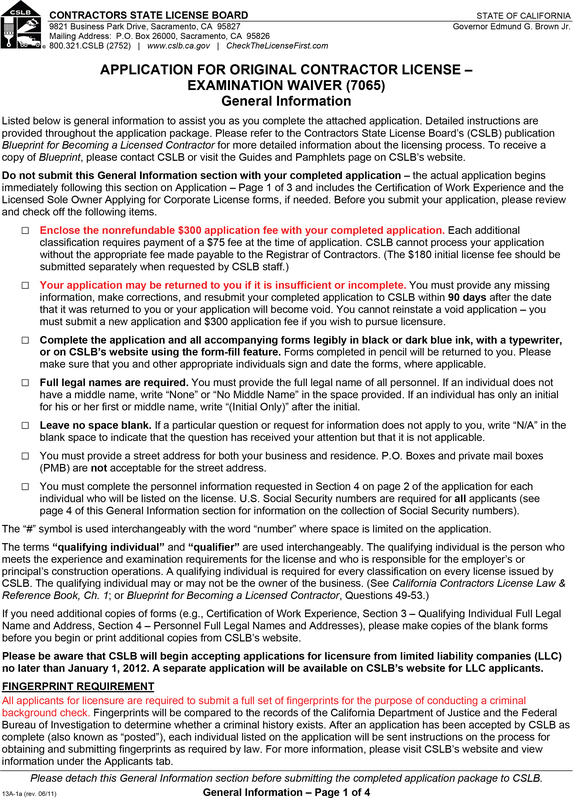 CSLB also will seek to revoke qualifier status previously granted to anyone whose actions demonstrate they do not have an ownership stake or are not active decision makers listed on a license. A new law that took effect in January 2014, Business and Professions Code section 7068.1, now authorizes CSLB to discipline a qualifier, and the licensed entity they are qualifying, when the qualifier is not actively involved in the construction activities of the license they are representing. In addition to administrative penalties, the individual falsely serving as a qualifier on the license can be charged with a misdemeanor and be sentenced to serve up to six months in jail, and required to pay a fine from $3,000-$5,000, or both, if convicted. A review of Business and Professions Code section 7065 will provide further explanation of examination waiver laws.